Somalia: February, 2001: As I worked on the priority list of countries requesting us to come and help them with their health care needs, I was overwhelmed with telephone calls from members of the Somali community in Denver. They were urging me – no, -- begging me to consider traveling to Somalia in East Africa. The callers described the medical conditions there and told me that no one else was helping to meet the needs in that war-torn country. I tried to explain to the callers that I probably wouldn’t be able to travel to Somalia until the next year or even 2003. But they didn’t want to wait that long to get on my list. Early this month, Anna Marie and I were invited to a dinner meeting with the members of Somali Aid in Aurora, Colorado. We were served authentic Somali food and learned a lot more about the conditions in Somalia and the work of the organizing group, which originated in Denver five years ago. Before we left that Saturday night, I promised our hosts that we will carefully consider their request and perhaps be able to work their needs-assessment trip into a time slot this year should a previously scheduled trip be canceled or postponed. To my amazement, it became necessary to reschedule a trip I’d planned to take to Brazil between February 22 and March 5. I called Mohamed Egal, the spokesman for Somali Aid, and asked if the timing would be too soon for his organization to plan a trip for the two of us to Somalia on those newly opened dates. He said their organization would grab the dates gladly and make all the necessary arrangements for the needs-assessment trip. The State Department cautioned US citizens against all travel to Somalia in view of multiple threats including kidnapping and murder. 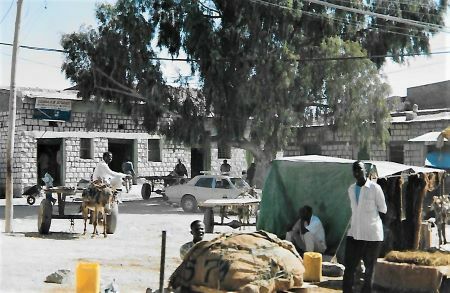 Without a US “diplomatic presence” in Somalia, travelers would have no recourse in an emergency, and the Somalia government clearly stated that it could offer no police protection. There is no US embassy or other diplomatic presence in Somalia. That State Department message triggered mental replays of TV newscasts in the United States during the early 1990s when the Somali civil war totally devastated Mogadishu, the capital city, and many other cities and communities in the country. I also had vivid memories of TV coverage of the rebel Somali soldiers driving an old pickup truck down the streets of Mogadishu and dragging the flapping body of a dead US marine in the dust behind the truck. The State Department went on to warn that non-Somalis shouldn’t even sail close to the shores of Somalia because of the extremely high risk that Somali troops could seize the ships, crews, and passengers in an effort to extract ransom money for their release. The rest of Somali is still unsettled and very dangerous. As I prepare for my trip to the area, everything is still uncertain. There truly is no agreement in Somalia, nor is there a central government, infrastructure, civilized politics, or security. But tragic need is certainly everywhere, exaggerated by years of exploitation, hatred, and strife. Somalia desperately needs Project C.U.R.E., and the help we could give could make a very dramatic impact in this war-torn country. I wouldn’t be exaggerating in the least to say that Project C.U.R.E. could significantly alter the health-care system of Somalia and thereby greatly influence the everyday life of its people for many years to come. Wednesday morning I asked Anna Marie to drive me to the Project C.U.R.E. office instead of dropping me off at Denver International Airport for the first leg of my trip to Somalia. Otherwise, she would have had to deliver me to the airport about five to twelve hours before my flight so she could head back to Evergreen and open her school before her students arrived. This way, I was able to finish a few more tasks at the office before departing. At 10:30 a.m., I checked in at the airport for United flight 252 to Chicago. At the airport I met up with Mohamed Egal from Somali Aid, who would travel with me all the way to Somalia. From Chicago we changed planes and flew United 928 to Heathrow Airport in London, arriving Thursday morning just after 7:00. Our routing required us to switch airlines in London and fly British Airways from London to Dubai, United Arab Emirates. Monotonous international travel is usually punctuated by irritating layovers, flight delays, and airline-staff incompetence. We tolerated all those frustrations trying to get to Somalia. It was nearly midnight Thursday before we landed in Dubai. Because of one delay or another, we spent the night walking and sitting in the Dubai airport waiting on delayed flights. Because of the escalated US bombing in Iraq just days before this trip, I was a little apprehensive about encountering anti-American hostilities as Mohamed Egal and I traveled through the Arab countries neighboring Iraq. But everything on the political front went well, and our flight finally left Dubai Friday morning at around 5:00, headed for northern Somalia. No one in the political world diplomatically recognizes Somalia. The only way we can get in and out of Somalia is to either charter a private airplane or fly on Daallo Airlines. No respected international carrier will accept the risks or try to work through all the entanglements and chaos of servicing this troublesome country. However, some enterprising Soviets decided to seize the opportunity to make some quick rubles and agreed to set up Daallo Airlines to service Somalia. They stole, hijacked, or by some other means procured five airplanes. Those five airplanes are the only way Mohamed and I can commercially fly to and from Somalia, or within the country. Only one of the planes is a jet; the others are propeller driven. All of the flight crews on Daallo Airlines are Soviets. The airline employs a couple of Somalis on each flight to instruct and control the passengers, since, quite obviously, none of the Soviets want to learn the Somali language. I made friends with one of the pilots, who was from Tajikistan and spoke some English. When I told him that Project C.U.R.E. sent about a million dollars’ worth of medical supplies and equipment to his country as a gift to help his people, and that I had traveled extensively throughout that part of the world, he really became friendly. I figured that if anything went wrong on the flight, I would like for him to be watching out for me. When we boarded the airplane in Dubai, I spotted lots of things that could go wrong with the flight. We were going to fly in the only jet in their fleet, which was an ancient Russian-built plane with a configuration of three jet engines on the tail. The last old jet of that kind that I had flown in from Beijing, China, to Pyongyang, North Korea, had Air Koryo painted on its fuselage. In the front of the plane were fold-down, wooden table trays for reading or serving food. Torn fabric on the plane’s interior had been repaired with glued-on canvas patches. Many of the passenger seats didn’t match the rest, so some airplane cannibalism must have taken place somewhere along the line. I could only shudder when I thought about whom and where—or if—anyone maintained the equipment. There was no aircraft hangar or maintenance facility to be seen. Pictures immediately replayed in my mind of the old Russian helicopters that the general in Nagorno-Karabakh had used to fly Baroness Caroline Cox and me over the no-man’s-land between Yerevan, Armenia, and Stepanakert. The engine oil from the radial helicopter engines had actually been leaking profusely from the bearings and running over the cowling just below the rotor blades. The old Russian choppers had safely ferried us to where we needed to go that day, and I was praying like crazy that this old Russian museum-piece jet was up to taking Mohamed and me safely across the long stretch of gulf waters from Dubai to the northern coast of Somalia. Surprisingly the flight was quite smooth and quiet. My Soviet pilot friend left the cockpit and came back a couple of times to chat with me. He had placed me in one of the front seats, where I could have some leg room. Serendipitously, seated next to me on the flight was the Somali minister of industry. We had lots to talk about before we landed in Berbera, the main port city of Somaliland. The airport facilities weren’t much to brag about in Berbera. Ten years ago, when the United States was involved in Somalia, our military had operated a base out of Berbera, so after the US departure, the Somalis inherited a nice long runway paved to our government’s specifications. All of our luggage was unloaded from the Russian jet, and those of us traveling on to Hargeisa watched as our bags were thrown into the cabin of the next plane we would board for our destination. I wandered into the dirty, crumbling air-terminal building and found a dusty, old wooden bench to plop down on. I had been traveling three days and two nights without sleep, shower, or change of clothes. But only one short segment of travel remained to reach our final destination of Hargeisa, Somaliland. While sitting on my wooden bench, I was fascinated by the scenes around me. Many of the men were sitting in clusters breaking off green leaves and twigs from small plants cut to about twelve inches in length. Mohamed told me they were chewing qat, a mild narcotic that can become quite addictive. He explained that it was a cultural tradition, but it has become a big financial commodity now. I shook my head and wondered where in the world a country so racked by abject poverty might come up with any money at all to purchase narcotics. Another interesting observation made me smile. Conservative Muslim women who live in Arab-influenced countries cover up almost their entire bodies. Usually only their eyes and the bridges of their noses are exposed. And depending upon the style of footwear, a portion of their feet might be visible. But for Muslim women, the hands and arms just a few inches above the wrist are the prime areas for displaying status and style. Over the years henna has become very popular. I’ve seen henna art displayed on women from Pakistan to Palestine. Henna is a dark natural ink that is used to draw intricate and delicate designs on the skin. The colors usually include dark browns, dark greens, and black. The artwork looks like a tattoo, but the ink isn’t injected into the skin, so it isn’t permanent. Eventually it wears off. Instead of polishing the fingernails, the women ink the tips of their fingers. To top off the display of status and style, they accent their fingers and wrists with as much gold as their positions in life can afford. Mohamed Egal told me that the only way many families survived the Somali wars and famine of the previous decade was by the parceling out and selling hidden gold rings, bracelets, and neck chains, since there were no banks or other financial institutions where they could store their wealth. The Russian plane assigned to fly us to Hargeisa was something I would have expected to see in a windblown, airplane-salvage graveyard in Arizona. It was a twin-engine, propeller-driven craft set up with forty-four hodgepodge, old seats. All the luggage was stacked inside the passenger compartment toward the front of the aircraft, without any tie-downs, nets, or constraints. It was just stacked loosely and piled to the ceiling. It reminded me of the time I flew across Uzbekistan in a Russian Yak-20, in which two rows of seats in the passenger cabin had been removed to accommodate a full pallet of sacks of grain. On both occasions I had grabbed a seat as close to the back of the plane as possible. In case we encountered turbulence, I didn’t want to be crushed by a renegade piece of cargo. Just as we were boarding the old Russian plane, I noticed the tires on the landing gear. They weren’t just bald; four of the six plies beneath the tread had worn through. That bothered me. I had Mohamed jump out and take a picture of the tires. I figured that photo would be good for memories somewhere down the road. Also good for later memories was an incident that happened midflight. A common old cockroach crawled out of the covering of the seat I was occupying, quickly ran over my shoulder and across my chest, and then jumped and disappeared somewhere in a dark crack. That was a first. I had never seen a cockroach on an airplane before. Besides the six-legged stowaway, I looked around and counted fifty human passengers. I knew I had correctly counted forty-four seats. Some of the passengers were standing, and some were sitting on the stacked luggage toward the front of the cabin. I really didn’t want to know how many had fastened their seat belts—if they had seat belts that worked. Even the aisle was crammed with luggage, buckets, and packages. Next Week: Encountering Problems in Somalia – Including the U.N.